Some studies suggest that older workers are favoured in their access to managerial roles and many executive recruiters highlight the importance of extensive experience in senior level roles. Yet, we have spoken with two senior executives just today who can see no other reason for not getting their foot in the door with a new company than… their age. There is no question that age discrimination in the job search still exists. But why? We all hold beliefs about the abilities of individuals in relation to their age that, often, we are simply unaware of. We make quick assessments of people without realising. It is this unconscious bias – what the employer believes your age means for them – that is the problem, not your age! 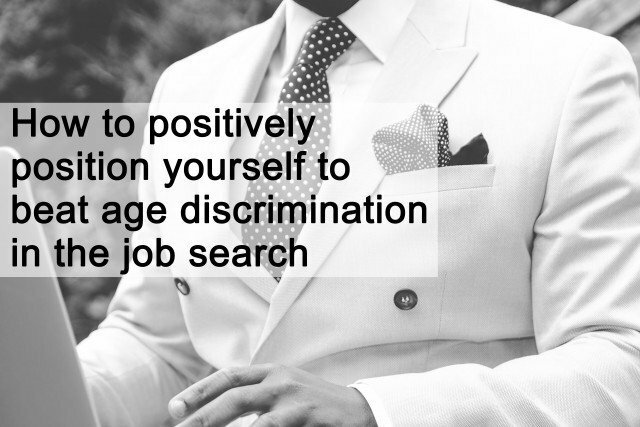 So let’s talk about what you can do to overcome age discrimination in your job search. What are the hiring manager’s concerns? Put yourself in the hiring managers’ shoes and take a moment to get a sense of their concerns, especially those that may relate to age. They might assume you’re counting down the days to retirement. Perhaps they think you are over-qualified for the position and that means you might be quick to leave when a better opportunity arises. Maybe they are making a sweeping generalisation about the ability of professionals at your age, seeing them as less adaptable, flexible and creative; not up-to-date; lacking the energy and physical capacity required for the role (for some, this might be true. But not for you). What other concerns might the hiring manager have? It is these concerns that often inadvertently lead to age discrimination in the job search. After considering the hiring manager’s perspective, you’re in a great position to start thinking about how you can dispel any possible misconceptions (many competing candidates won’t get this far). You’ll find you can manage a lot of these potential concerns through your CV, LinkedIn profile and interactions with the employer. You may find it easy to demonstrate creativity, energy and physical capacity by mentioning your pastimes, which demonstrate your health and vitality. You can convey your commitment and intent to stay with the team long-term, speaking with enthusiasm about the role you hope to land and all the reasons you’re passionate about working with this company or within this sector. Draw attention to examples of situations where you have shown great adaptability, flexibility and creative thinking in your career, emphasizing the results you achieved. Establish yourself as a social leader to evidence that you’re willing, able, adaptable and tech-savvy. This is also a great way to demonstrate your expertise, influence and become known in your field. Age is not an issue when the hiring manager’s attention is on your skills and competencies. You know that you’ve built up an extensive set of skills and knowledge over the years and you can use this to position yourself as the best candidate for the job, whilst highlighting the positive attributes associated with older candidates. Focus on what you bring to the role that competing candidates may be unable to offer and, importantly, how you can help. What problems can you help to solve? What issues keep the hiring manager up at night? Use your interview (or even a pre-interview discussion) to ask questions and uncover problems as if you were a consultant. You will gain a deeper understanding of their needs than any other candidate will, winning a prime opportunity to prove your future worth. Talk about how you have handles similar situations; what you’ve learned, the results you achieved and the industry connections you have that could prove to be valuable in this instance. Demonstrate that you are the best person to solve the hiring manager’s problem and their concerns about your age will soon be overshadowed by the benefits of hiring someone who is as insightful, skilled and quick off the mark as you are. So dig a little deeper than other candidates will to understand the needs and concerns of the hiring manager and you’ll position yourself as a strong candidate for the role, regardless of your age. Do you believe you have encountered job search ageism? What strategies have helped you to overcome this and land a new role? Please share your experiences below.